Chapter 28: Models of Evolution: Figure 28.25 - Solutions to the basic diffusion equation, dψ/dt = σ2d2ψ/dx2. Figure 28.25. Solutions to the basic diffusion equation, dψ/dt = σ2d2ψ/dx2. (Left column) If the population starts concentrated at a point, it spreads out in a Gaussian distribution with variance σ2t. (Middle column) If the population starts out living only on the left side (x > 0), the step smooths out over time. 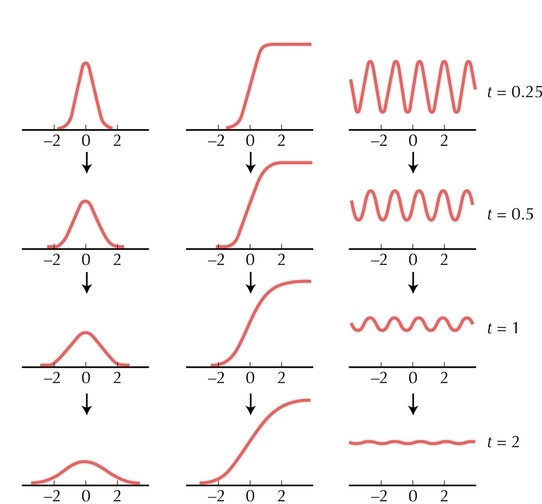 (Right column) Fluctuations in density (~sin(ωt)) decay in amplitude, as exp(–σ2ω2t/2). The rate of diffusion is set to σ2 = 1.